In Edmonton, nothing screams spring quite like the appearance of a new pothole on your route to work. With 643 potholes per year reported on average, it’s no wonder that the city has created a “Report a Pothole” program. Potholes cause a headache for everyone involved, from city crews trying to keep up with road repairs, to drivers trying to avoid costly vehicle damage. Don’t worry; we’ve put together a helpful guide to get your vehicle through pothole season safe and sound. So you hit a pothole, now what? Potholes are everywhere. Generally speaking, if you’ve hit a tiny dip in the road your vehicle should be fine. However, if you’ve hit a larger pothole there are a few steps you should take to ensure your safety and the safety of other drivers on the road. 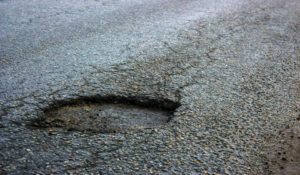 Unfortunately, potholes can result in some pretty serious physical damage to your vehicle. Here are a few of the more common issues that potholes can cause. Wheels and tires – As the first point of contact with the road, one of the first things you should check on is your wheels and tires. Ensure that there are no cracks or bulges in the tire walls and make sure that you don’t have a flat. Check your wheels to ensure that the rims aren’t bent or cracked. Suspension – While your suspension system is designed to handle bumps in the road, it’s not equipped for a jarring hit like a pothole. Misalignment is one of the more common issues, so watch out for the vehicle pulling to one side, poor handling, or uneven tire wear. Odd sounds or vibrations are also an indicator that something isn’t quite right. Exhaust – Because it’s located underneath the car, the exhaust is extremely susceptible to pothole damage. Pay attention to any loss of power, strange noises, or smells of gas as these can all indicate exhaust damage. If in doubt, bring your car to a mechanic and get it checked out. Body – This is especially a concern if your car sits lower. Check your bumpers as well as the side skirts for scrapes, dents, scratches, or cracks. Where is the pothole located? What street/avenue? What lane? Which direction were you traveling? When did the incident occur? What date, day of the week, and time did it happen? Was it during rush hour? What were the road conditions like? Were there other potholes or similar road problems? Don’t rely on memory alone. It might be helpful to return to the scene and take some pictures for reference. If possible, try to include a familiar object such as a shoe or water bottle in the picture to give a sense of scale. If there were any witnesses, try to get their contact information. It may be a bit tricky unless there was a major incident, but any additional information or perspective could help. The City of Edmonton actually has an online system that allows you to report a pothole, as do a number of other municipalities.Take advantage of these systems to report the pothole so it can be repaired and prevent further issues. Now that you’ve taken care of some more logistical items, you can take care of any damage to your car. Don’t wait too long, as a little issue can become a big problem if left unchecked. Be sure to save any quotes, invoices, or receipts, including car rentals or additional transportation required due to the damage. Depending on the circumstances, you may be eligible to receive some compensation. This is where all of the previous information will come in handy. Not every instance of damage will result in compensation, in fact, most don’t. There is an entire list of criteria that a claim needs to meet in order to be eligible. For example, you need to make the claim within 30 days of the incident, and there must be evidence that the City knew or should have known about the offending pothole. You can always appeal the decision if you don’t like the verdict. The best way to save yourself money and frustration is to avoid pothole damage in the first place. It may seem like a tall order considering just how many potholes are out there, but here are a few precautions you can take to minimize damage. There’s no reason to wait until your vehicle gets damaged to report a pothole. Reporting a pothole right away notifies the proper city crews and allows them to get it fixed sooner. If you see a pothole coming up and have no opportunity to safely avoid it, slow down. The faster your vehicle is moving, the greater chance you have of damaging your vehicle. At the same time, be sure not to slam on your breaks either. This could do just as much damage. If you notice a puddle in the middle of the road, drive with caution. There’s no way of knowing how deep it is, or what the road is like below the surface of the water. If you have no safe option to avoid it, slow down and drive through with caution. Ensure that your tires are properly inflated, especially after winter. Properly inflated tires offer extra cushioning and protection between your car and the road. Also be sure to inspect your wheels for general wear. A tire that already has a weakened wall is more susceptible to damage than one that’s in good condition. Whether a run-in with a pothole left your car in need or some repairs or you’re looking to do some regular maintenance, our team can help! Contact Freeway Auto Body today!